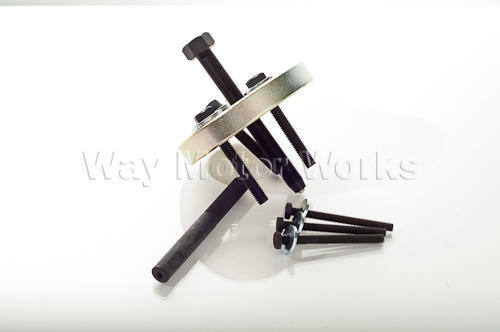 Crank Pulley Removal Tool kit for 2002-2006 R53 MINI Cooper S, and 2005-2008 R52 MINI Cooper S convertible. This tool is also called a Harmonic balancer puller. WMW knows how many crank pullies have failed on MINI Cooper S cars. And if yours is one of them this is the tool kit you'll need to remove it. This kit includes the crankshaft pulley puller and the center pin that the puller presses against when you are pulling the pulley. Use this tool and do it yourself. Center pin for tool to press against. Do not attempt to remove the factory damper from your R53, without this tool. It took minutes to install and removed the factory damper, literally. And WMW, delivered as promised. These guys are great and customer service is excellent.